A movie review of Google’s "Project Re:Brief"
It was an incredibly inspirational and well-produced documentary about bringing the halcyon days of advertising to 2012. I walked away inspired to do something creative and to get back to the heart of a great story. But I am getting ahead of myself, let me back up. I’ll cut to the chase – the short answer is yes. The original ideas behind the campaigns are solid, creative, and rooted in simple human truths that transcend any sort of medium. The longer answer is – yes, if you have the time, money and resources of Google. Yes, if you are Google in 2012 and your stock price is $614.98, anything is possible. I finished the movie inspired. And then 2 minutes later I was annoyed. I was annoyed because as a former Account Director at an Ad Agency I know two things: 1. Convincing a client that this effort is a compelling business strategy is an extremely difficult job and 2. Who’s paying for it? Google created this project, Google paid for this project, and I have no doubt that it is running them tens of millions of dollars when you consider all the talent, travel and high-value production behind these four projects. And for what? To prove that banner advertising is not dying, it just needs to be injected with the best ideas in advertising? So once I came off my inspirational high of seeing the old and young creative minds literally giving the world a coke through rigged vending machines all around the world; and following the journey of the loveable and faithful Volvo owner who has 3,000,000 miles on his Volvo, and seeing the life of “Ralph” the Alka Seltzer man come to life in a sitcom spoof, it became very clear, a great story isn’t going to save or regenerate digital banner advertising, because in 2012 digital advertising is social advertising. I daresay the banner ad is in its final act. And Google really doesn’t want to hear that. Yes, all three of theses brands run some traditional advertising. But their brands were not built by advertising. They have built their brands through customer experience and deep levels of social media engagement. The Zappos brand was (and is) built during its interaction with its customers, and with the efficiency of its online store. And then, by those happy customers sharing their amazing customer service experience with everyone they know. Starbuck’s primary advertising is its in-store experience and its cups. They re-design their cups with the seasons, and all their stores offer the same experience. And I believe their loyalty program is working with 29,867,118 Facebook fans. Google’s brand has been solidified by the search experience (their product) and press about their culture. Google’s TV ad didn’t create my brand perception – my thousands of successful searches did that. So let’s circle back to Project RE:Brief. Can the ideas that resonated 40 years ago, resonate today? Absolutely. We all still eat too much, can’t believe it, and need an Alka Seltzer. 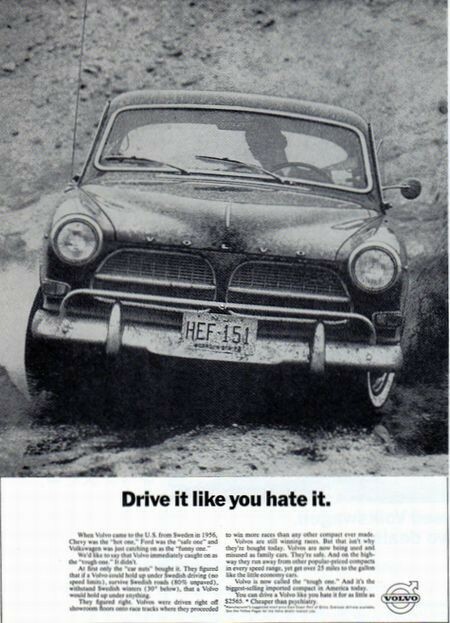 There isn’t a red blooded male American alive who doesn’t want to drive his car like he hates it. 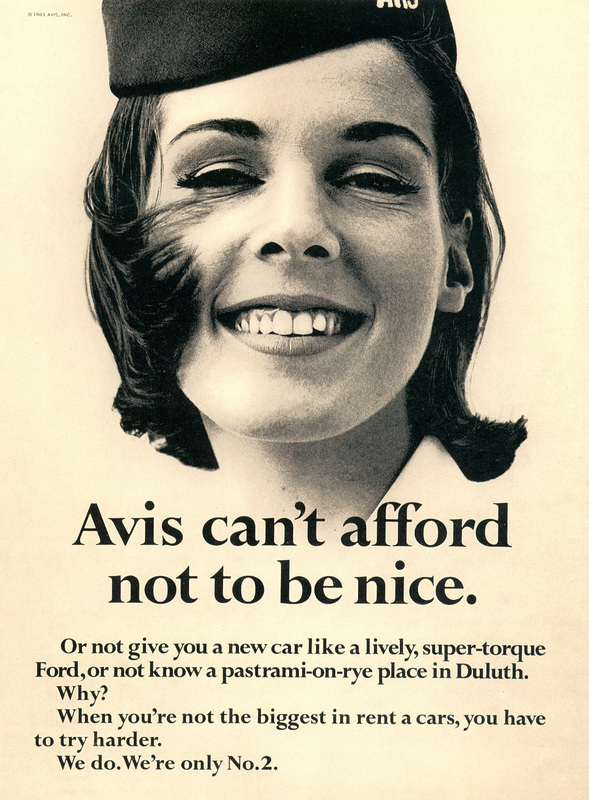 Avis still uses the “We Try Harder” tagline! But my advice to Volvo, Alka Seltzer, Avis and Coke – make your product stellar, surprise and delight your customers, and create dialogue with your audience that is compelling– be more social all-around. Avis – make your rental car areas show that you TRY HARDER – play area for kids? Couches? Bottled water? Alka Seltzer, start a Facebook page or Instagram campaign (call Foodspotting!) where people share the food where they “ate the whole thing.” Volvo – let people test drive a car and drive it like they hate it on Volvo branded obstacle courses. And put the video of their drive on a branded You Tube page; make it a competition. These truths were right 40+ years ago, and they are right today. A human insight will always transcend time and always be compelling. And that is why it is inspirational! But they need to become social both in-person & online, not upgraded banner ads with bells and whistles far out of the reach of most companies marketing budgets. I appreciate Google’s tenacity to show that digital advertising could be more. They do have the money and the means to be the thought leader, and push us all to think bigger. But it was fairly obvious to me by the end of the movie that not all the Clients “bought” it, there was not a huge ROI at the end of the story, and the money it would take to get people to really participate – well only Google has that. If you do get a chance to view the movie, I do recommend it. I love that the wisdom of the old is the true hero in this story. It really is an inspirational movie pushing us all to create and tell the best story, no matter our age. Kudos to Google for showing us that brilliance, no matter the era, is always in vogue.